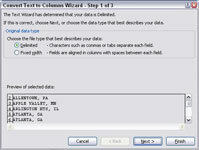 Use the Convert Text to Columns Wizard in Excel 2007 when you need to split combined data into separate columns, such as a first name and last name; or city, state, and zip code. This type of combined data often results when you open or import files created in another application. 1If necessary, insert blank columns to the right of the cells you want to convert into multiple columns. If you want your data in three columns, you must have two blank columns. 2Select the cells you want to convert. You can’t split empty cells, and you can’t split merged cells. You must first unmerge the cells. 3Click the Text to Columns button on the Data tab. The Convert Text to Columns Wizard appears. 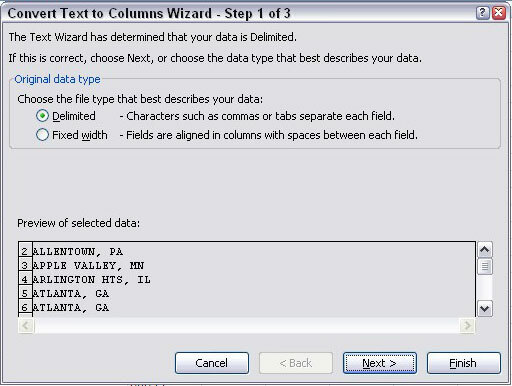 4Select the Original Data type that best suits your existing data. 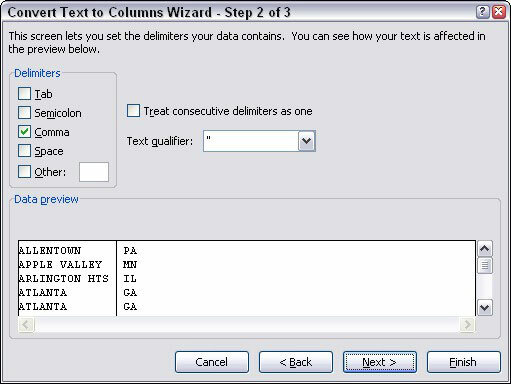 For example, if you’re separating text that is variable in length such as a first name and last name, select Delimited. The option you see next depends on which data type you selected in the previous step. 6If you selected Delimited, enter the character you use to separate your text. If you selected Fixed Width, click the ruler bar where you want the data to split. Excel separates the selected cells into multiple columns.